The late ’60s and early ’70s will be remembered for plenty of things. It was the era of Afghan coats, stacked boots, keep on trucking badges and hair that was long at the back and short on top. Weeding the garden meant something totally different to what it means now, and when you travelled abroad you always knew the weight of your luggage right down to your last ounce. The world of biking was different, too. With the chopper fad on a roll and the Japanese coming in relentless numbers, the death knell was sounding clearer than ever for the British motorcycle industry. The bikes being produced were, it needs to be said, not of startlingly high quality. Nevertheless, a few much loved icons of that age remain. The BSA Goldstar, the Triumph Bonneville, and the Norton Commando. Japan gave us the Honda CB750 and the now fashionably cool Kawasaki Z900. And Italy, not to be outdone, produced the gorgeous MV Agustas. Forget about wearing dayglo T-shirts or open-face lids on this thing, though. When you’re riding the Magni 1200S you want to be looking good. So what is this retro beast? It’s a Magni. Basically, a 1200 Bandit engine in a Magni frame with classic MV styling. But to really understand what this bike is all about you need a quick history lesson that starts back in 1947 with Italian Arturo Magni. Magni started his career in the racing department of Gilera and stayed until 1950, when he joined the newly-formed MV Augusta racing department. He was there until MV pulled out of racing in 1977. With riders including Giacomo Agostini, Mike Hailwood and John Surtees, the firm won 75 world championships and over 3000 races in all. Now out of work, Magni set up a shop to build special versions of production bikes, starting with MV. The first street versions used new frames, seats and tanks to turn road-going MVs into virtual race bikes. But the numbers of MV road bikes weren’t available, so he turned to BMWs, Honda 900 Bol D’or replicas and Guzzis. These bikes continued throughout the ‘80s and ‘90s with the Guzzi-powered Sfida 1000, 1100 and another version powered by the Guzzi four-valve engine called the Australia in honour of its antipodean importer. So much for the history lesson. The latest bike from the Magni plant in Gallarate, around 10 miles from Varese and right in the heart of Italian motorcycle country, is the 1200S Como. It’s being imported by Middlesex Triumph dealer Jack Lilley, and is available strictly to order. The first thing that grabs you is the way the thing looks. It really is a 1200 Bandit under there. The switchgear, swingarm, headlight, clocks and the engine are all straight off the donor bike. But then there are other, more individual; touches, such as the black-painted, 1970s-look exhaust pipes, the chrome mudguards, the rear light and that long and low tank sprayed up in the bright blue, white and red or the classic MV Augustas. There are also modern Brembo four-piston calipers and twin discs at the front, with the Suzuki master cylinder and span-adjustable front brake lever. The classic feel doesn’t go too far, so there’s no kickstart just the usual button. But the first time I straddled it I found myself reaching down near the carbs for a choke lever before I suddenly remembered that it’s really a modern bike with modern conveniences, such as a choke on the handlebars. Although the frame looks like the standard Bandit, it’s actually Magni’s own chrome-moly, tig-welded frame sprayed up in red to match the bike’s seat and paintscheme. The twin shocks are Showa and, with a four-way click adjuster that actually doesn’t do very much, look suspiciously like the ones from Honda’s discontinued CB1000. But somehow that doesn’t seem to matter because you feel like you’re riding a very quick classic bike with a bit more civility. 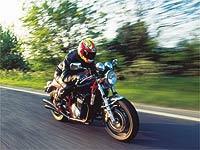 For one thing, you literally almost lie down on the bike with your bum pushed up against the soft seat-stop, and you can hear the chrome front mudguard and side panels vibrating but only barely so because the noise from the pipes takes so much of your hearing away from any other sound. It rasps rather than screams, and though it wouldn’t pass contemporary noise limits, it’s not as load as a true open-corked ‘70s superbike. And though the bike will rev all the way round until the needle stops, and pull the front wheel in the air in the process it feels nicer and more suitable to change up at about 6000rpm. That’s where the meat of the torque is, and you can still benefit from the aural experience from the four pipes when you short-shift. An ideal, laid-on-the-tank-with-Woodstock-on-your-mind speed to cruise at is 80mph, though it will pull up to about 140mph. However, if you can hang on to it at that speed, you really must have been a child of the ‘70s. Go too quickly and the limits of the suspension soon lets you know. The front dives and uses up its travel with a mild stroke of the front brake lever/ the rear shocks are so firm that in a corner you have to work it to stop the bike running wide and find yourself hanging off to stop the flip-up sidestand grounding. It’s the kind of bike you want to ride for 30 miles until the seat has done wonders for your bum, pull up and then do it again. At £11000 it sounds like a lot of money, but to me it’s a bargain and you’re buying a piece of history that will touch your life through any flared trouser fad.